Media That Matters is a 5 day co-creative experience that cross-pollinates across all genres and platforms of media and focuses on social change. Amidst a spectacular wilderness setting, away from daily distractions, peers interact in an innovative format to spark a better future for creators, their career goals and the media they create. Sue has been on the design and facilitation team for this event for many years having first encountered the Media That Matters tribe in 2005. One of Sue’s Grad School Mentors, JoAnn Schindler called her one day to say 'Sue, I think you should attend this event. It's a combination of leadership practice, contemplation and creativity.' Sue can't thank her enough for the entry into the ALIA world. She attended her first ALIA conference and met many of her tribe there. She joined the West Coast branch of ALIA in 2015 and hung with that group of talented designers until the Spring of 2017. She managed to support two conferences as part of the design and hosting team while upping her skills by soaking in the fantastic modules by creative and skilled practitioners. Just to wet your whistle, here is one of the quick descriptions for an ALIA Intensive: STRENGTHEN YOUR CAPACITY TO LEAD FEARLESSLY IN CHALLENGING SITUATIONS. PARTICIPATE IN A POWERFUL LEARNING COMMUNITY AND EXPERIENCE “DEEP DIVE” MODULES WITH WORLD-CLASS FACULTY. Yep, good peeps to hang with. In 2016, Sue started another social experiment called Inside Green. With the support of a Creative BC and BC Arts Council grant, and a team of generous and motivated creatives, Sue’s team pulled together a beta site and several events to test their idea. InsideGreen.ca is a Vancouver-based project that connects people through the care and gifting of indoor plants. Through its interactive mapping website, you can see how your plant connects you to the city. Once registered as a Steward, you list the plant(s) you are caring for, upload photos and can respond to some story and questions prompts. On the site they support 10 types of plants in their plant family with care tips and short how-to-propagate videos. Their goal is to encourage you to have plant babies and gift them, thus inviting others into the Inside Green community, building a data map of each plants' Plantcestry, and spreading the practice of caring for nature across cities from the intimacy of home and work spaces. As of December 2017, Inside Green has about 1000 plants registered and has had a presence at three Farmer's Markets, the Mural Festival, the opening of a business, brought 150 plants to staff at a law firm, taught a 4 week curriculum at an elementary school, are supporting a Global Stewardship class full of 15 year old boys, and has hosted a plant cafe for young adults with developmental disabilities. Wherever it goes, Inside Green loves to help people fall in love with plants and be pro-active about the air quality in the spaces they live and work. They are happy to offer propagation workshops but warn participants that the trading of plant babies can get rather feisty! As part of a continuation from Sue’s MA studies where she looked into supporting adults in opening new thinking patterns to get to innovative ideas, she started a series of Playshops so she could have a lab space to experiment. 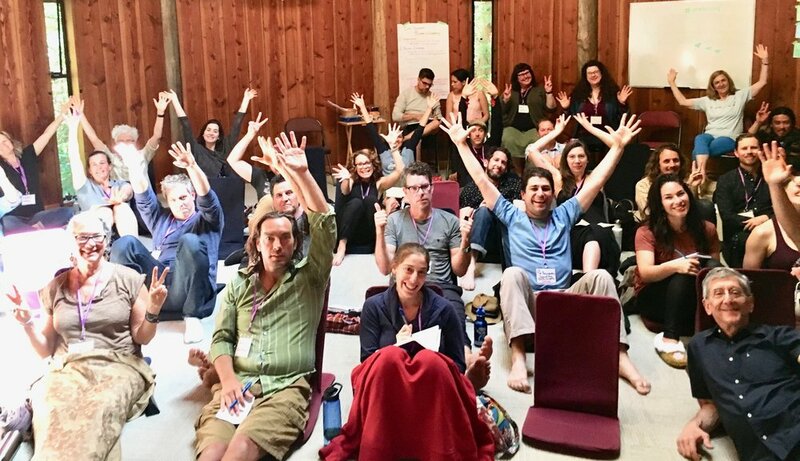 Sue’s goal was to take adults who didn't know each other and lead them through 90 minutes of directed creative and playful activities to see how it impacted their sense of flow both individually and collectively. She designed with multiple types of expression in mind (verbal, spacial, kinesthetic, metaphorical, logical, etc...) and ensured that thinking styles and modalities changed several times in one session. Participants reported time passing very quickly, a sense of surprise around their creative output, a sense of delight at co-creating with others, and quickly feeling a sense of belonging and care for those they were with, despite not knowing anything about each other. Some other charming testimonials included a sense of excitement waking on Playshop days and sleeping better after a Playshop evening. Sue loved these sessions and would happily launch this living creative lab support again for a client. After being tasked with conducting several interviews with small to medium sized screen based media companies in BC to determine some strategic needs, Sue with client Canadian Media Producer’s Association - BC Branch, designed and produced a four part x 4 hour Business Affairs training program. Led by a medley of industry veterans, Sue designed and facilitated sessions in Spring 2016 based on the following themes: Business Affairs for Development, Business Affairs for Production Part I, Business Affairs for Production Part II, and Business Affairs for Co-Production Treaties. In it's first year, 2014, Sue was asked to come out to Toronto for a few months to help conceptualize, fund raise, plan and execute this idea of the first ever National Canadian Film Day (NCFD). The purpose was to create an initiative that investigated the question 'do Canadians care if they have their own film culture?'. The result was Sue taking on the title of 'Quarter Back' and helping to stir up a resounding YES from the country. As NCFD continued to grow, Nudge Consulting was brought on to lead the development and execution of the event in British Columbia for 2016 & 2017. With an amazing small team, Sue oversaw the growth including the Canada 150 in 2017 version which included 225 screenings in BC, two pop up short film stations, a social media party, a VIA Rail film stunt, several media interviews and the transporting of film talent all over the province to engage in special events and panels ALL ON A SINGLE DAY! So many communities and unexpected partners jumped in to celebrate national talent and felt they were connected through the one day event. National Canadian Film Day is a perfect example of how Sue likes to work with an inquiry question and then help nurture an experiment that can scale to resounding impact!